I’m reading mysteries in March! I’ve been craving this kind of read for literally months now and I haven’t let myself. When I first started feeling this way, I couldn’t succumb (other commitments) and then I somehow kept putting it off. In preparation for Jen’s Moonlighting for Murder crime fiction theme week, April 3-9. Books fitting this designation are piling up on my shelves! Just a few of the books weighing down my to-be-read shelf, as well as my heart, that fit this aim. I hope to read a ton of these in March! And I can’t forget that at least two of the books My Friend Amy challenged me to read in 2011 fit nicely in this category. Well, those are my reasons. (For now. I may think of more later.) Want to join me? I’d be thrilled to have company in this quest! And even if you don’t have a long-as-your-arm list of reasons to read along, it doesn’t matter. Do it for fun! For my purposes, mystery is a catch-all term and includes cozy mysteries, police procedurals, legal thrillers, detective stories, gothic mysteries, historical mysteries, espionage, crime fiction, psychological thrillers, medical thrillers and political thrillers. I’m using broad strokes here, people, not being nit-picky. I’m not necessarily promising to review all of the mysteries I read in March in March (or at all). This is a reading challenge adventure, not a reviewing challenge adventure. This entry was posted in blogging, books, fiction, mystery, WordLily and tagged Mystery March, reading. Bookmark the permalink. I wish I could join you. This sounds good. 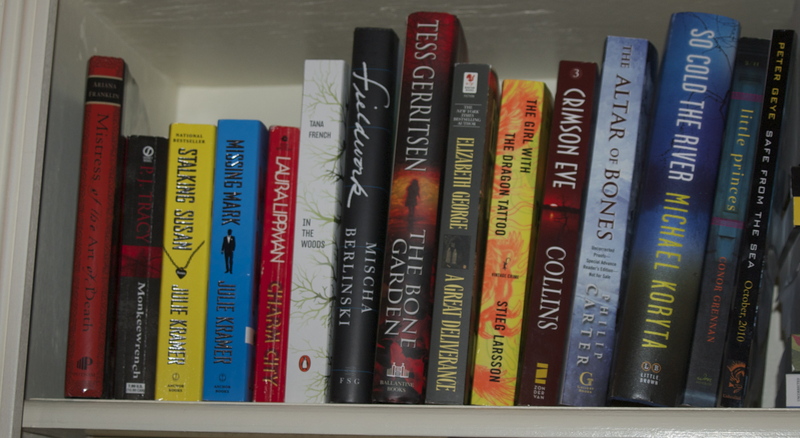 I love mysteries and have tons of them piling up, including a few I see on your shelf (Gerritsen, George and French). However, I have to fulfill all review obligations before the baby comes at the end of March and then who knows how long before I can pick up another book. Anyway, have fun as it certainly looks like fun month.